Running isn’t like most other activities. Do it, then do it some more, and you can become decent at it. For some runners, running can get boring. It all depends on the runner’s personality. People who are very serious about their running are frequently not serious enough about the resting phase of their training. 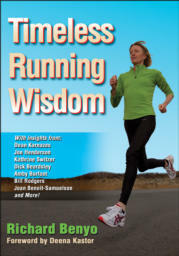 Timeless Running Wisdom is the ultimate runner’s toolbox! With stories and insights from long-time runner Rich Benyo and a few of his world-class friends, learn the best training methods that have withstood the test of time. Break through plateaus, tap into the runner’s high, and improve performance to achieve a sweeter running experience.